The scrumptious saltiness of bacon with just the right touch of sugar, plus a little kick. These candied bacon bites are dangerously easy to whip up. Candied Bacon Bites are a delicious little nibble everyone will love – and they are so easy! 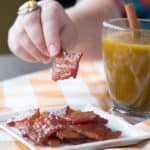 A bite-sized version of my Brown Sugar Bacon recipe, these Candied Bacon Bites are always a hit. Sweet and salty with just a bit of kick, they are totally addictive. 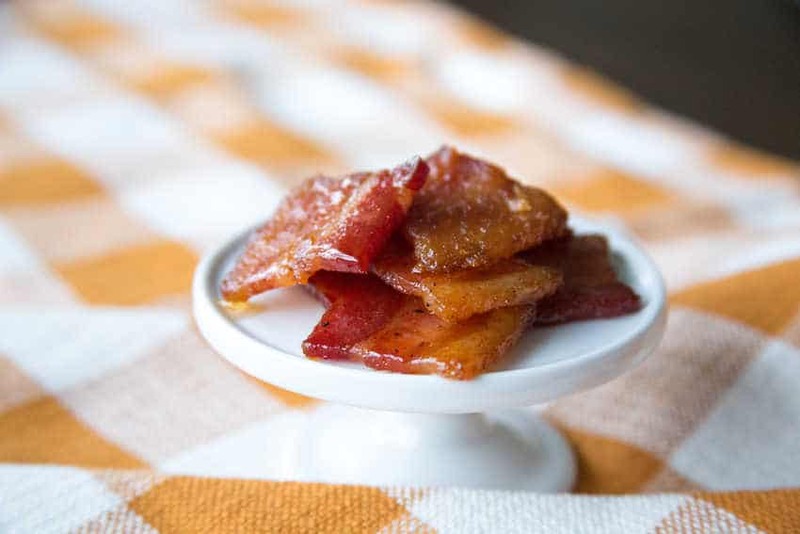 You’ll need a rimmed baking sheet and wire cooling rack to make candied bacon. Do not skip the step where you line the pan with foil – that foil is the difference between easy clean-up or an almost impossible to remove mess. Bacon drippings and sugar don’t scrub off very easily! Provided you use the foil, candied bacon bites take almost no time in the kitchen. I call for thick-cut bacon here, and that’s not merely a suggestion. Thin-cut bacon will scorch before the sugar has time to caramelize, and that’s not delicious. To answer your other question: YES, some bacon has gluten, either in the spices, binders or additives. Look for bacon marked GF – I like Welshire Farms, Jones, Hormel and Applegate. I usually make a double batch for parties or even small get-togethers, and a single batch when we’re just snacking at home. I think the flavors are a fabulous match for my warm Pumpkin Spice Cocktail recipe, so if it’s cold outside, I recommend you whip up a batch of those too! Line a rimmed baking sheet with aluminum foil. Set a wire cooling rack inside the prepared pan and set aside. Cut the bacon into squares. In a shallow dish, combine the brown sugar, chili powder and black pepper. Dredge the bacon squares in the brown sugar mixture and arrange the bacon on the rack. Sprinkle any remaining sugar mixture over the bacon. Bake in the preheated oven until crisp, about 20-25 minutes. Cool at least 5 minutes, and serve. This entry was posted in Appetizers & Snacks, Dairy Free, Recipes and tagged appetizers, bacon, dairy free, G-Free Foodie, gluten free cooking, gluten free holidays, gluten free snacks, kc cornwell. Bookmark the permalink. What's in the G-Free Foodie Box?